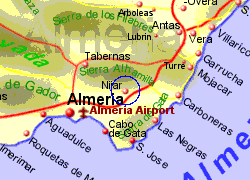 The town of Nijar lies approximately 25Km inland yet it's municipality (one of the largest in Spain) extends to the coast and includes the coastal towns of San José and Agua Amarga, and the working town of Campohormosa. 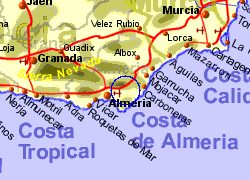 The municipality also includes most of the Cabo de Gata Natural Park. 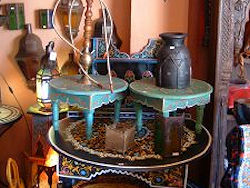 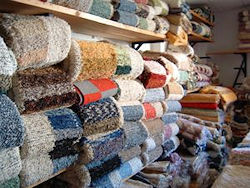 The town itself is well known in the area for its production of pottery and rugs, with coach trips bringing tourists from the coastal resorts for the shops that sell these items plus items from Morocco. 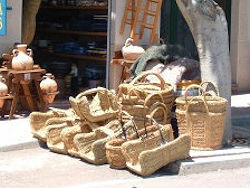 The land immediately around the town is quite barren, but the area around Campohormosa is extensively used for the production of vegetables grown under plastic. 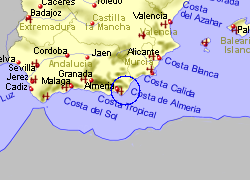 Map of the Nijar area.